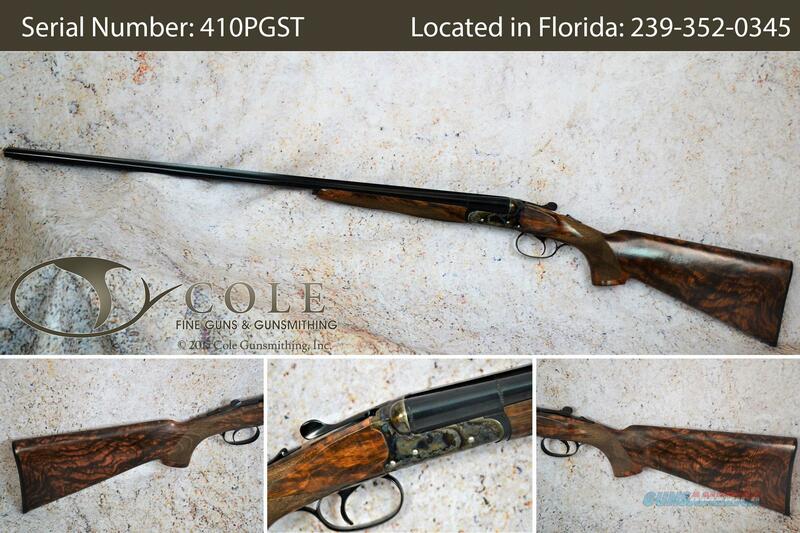 This is the lightest and most elegant small bore side-by-side shotgun on the market today. Its proportions have been thoroughly studied. Its carefully designed shapes are further enhanced by plenty of hand touches. The compact dimensions and slim line generate a very light, fast and easy to mount shotgun. The action machined from a solid bar of Nickel-Chromium steel undergoes a case hardening and additional hardening process for increased strength. The dimensions are totally scaled down and true to a .410 bore. Nothing is left to chance. The final result is that of a very solid and extremely durable gun featuring nice chrome finishing or color case hardening on request. This side-by-side comes standard with manual extractors, double triggers and pistol grip stock. Single non-selective trigger and straight English stock are available on request. The wood grain has been laser enhanced. Federal firearms laws do not allow us to ship firearms directly to you. Please contact us for ordering and shipping information. Drop at nose: 1 1/4"